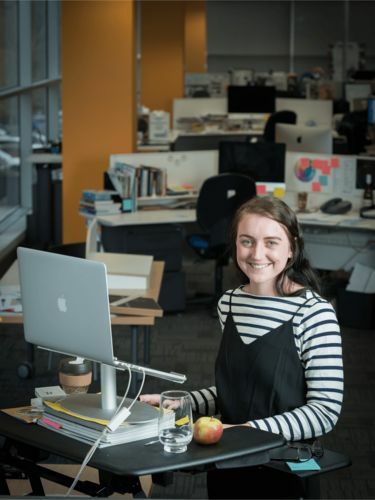 For Master of Publishing and Communications graduate Lachie Humphreys, writing, researching, interviewing and conversing with Miles Franklin Literary Award winner Frank Moorhouse were all in a day's work during her student days. A year later, she is Managing Editor. A year later, Lachean is Managing Editor at custom publisher Hardie Grant Media in Melbourne. Lachean graduated with a Master of Publishing and Communications in 2016 following her Bachelor of Arts in 2013. "My Arts degree gave me a really strong background in research and critical writing," says Lachean. "I studied what I really enjoyed, majoring in literature and history, and made up the other units in Japanese and creative writing." For her Masters in Publishing, Lachean was able to delve into the nitty gritty of editing and production, meeting industry wordsmiths, communicators and crafting a career path to covet. "As well as beginning to understand parts of the industry, the Masters of Publishing was much more practical rather than theoretical. With workshops and editing exercises, I started to hone skills and was able to recognise my strengths and weaknesses," Lachean says. "As it's quite a small faculty, I also met many people who worked within the industry who I've since crossed paths with." Lachean chose to take the minor thesis component of the degree to finish her Masters, allowing her to work at Hardie Grant while researching and writing throughout the year. "A definite highlight was meeting author Frank Moorhouse in Sydney, who was one of my main interviewees," Lachean says. At The University of Melbourne, Lachean voluntarily edited and wrote for the UMSU Women's magazine, Judy's Punch, which was great preparation for writing and editing after graduation. Today, Lachean's custom publishing work involves writing, editing and project managing for a broad range of clients from company publications to biographies and coffee table-style books. "On a typical day I arrive in the office, check emails and prioritise for that day," she says. "Every day is different, but I might edit articles that come in from writers or subedit articles once they're in their designed format." At other times, Lachean may attend a meeting with a client to present an idea, a concept, or a finalised piece of content - "whether that is an article, magazine, book or website". She looks at feedback and changes from clients and attends briefings or brainstorming meetings for a new project; checks proofs from the printer and approves them for print and occasionally works on researching and writing feature articles. Lachean says the most memorable part of university life was meeting people: "Take notice of the people you're meeting – your peers, as well as your lecturers, guest lecturers and tutors. You never know who you'll meet and what opportunities might come about from just chatting". For now, Lachean says she's focusing on gaining experience in her current role and writing away from work as much as she can. In the future, an international experience beckons. "I hope I'll be looking to work overseas. London and New York are a publishing industry dream," Lachean says. Learn more about the Master of Publishing and Communications program.